Billy Goat set the standard in 1988 for low noise, high performance, and low vibration with the QB of wheeled blowers. Today the durable Quiet Blow has the highest performance to weight ratio of any blower available. 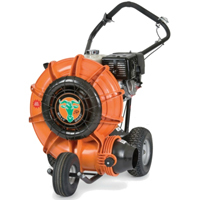 QB blowers are the choice of Lawn care & Paving Contractors worldwide. Now, Billy Goat Industries, Inc. adds another dimension to blowers with a full powered remote exhaust director. Traditionally, backpack blowers have been best at controlling air, but lacked the power to tackle large jobs. On the other hand, wheeled blowers could move large volumes of leaves and debris, but were not effective controlling air. Now, Billy Goat Industries, Inc., introduces the redesigned patented Quiet Blow® Series blowers that combine the control of a backpack blower with the performance of a wheeled blower. The new QB blowers feature a revolutionary exhaust design that concentrates and controls hurricane-force airflow into a tight pattern, offering superior control and performance. Direct airflow exactly where it’s needed. When it’s needed…simply by squeezing the ergonomically – designed lever on the handlebar. 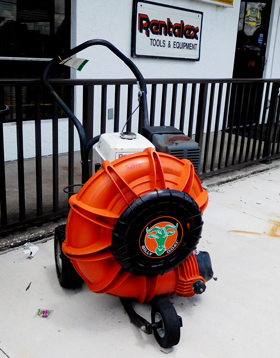 The Quiet Blow still produces the lowest noise levels of any wheeled blower on the market. Increased operator comfort – QB Series blowers feature a 14-blade nylon fan (E) to eliminate the tiring “gyro” effect common to many other blower brands. Improved performance – Large radius housing (F) provides impact strength, reduced turbulence, and less noise. Fatigue reduction – Shock isolation mounts (G) reduce fatiguing vibrations and pneumatic front and rear tires allow easy use on hard surfaces or turf. Reduced weight – Weighing 25 pounds less than competitive units, QB Series blowers are easier to maneuver and reduce operator fatigue.